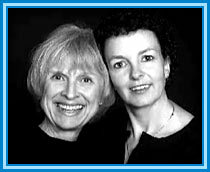 Caroline Jackson Blakemore and Barbara Weston Ramirez have a combined experience of over fifty years helping thousands of elementary school children with reading difficulties. They have given workshops on read-alouds to thousands of parents of babies, preschoolers, and school age children. With expertise in the field of emergent literacy and practical experience working directly with parents and babies, they are uniquely qualified to advise new parents on how they can help their babies and toddlers achieve future school success. As reading specialists, Ms. Blakemore and Ms. Ramirez can clearly see by kindergarten which children have been read to regularly. The children who have had books in their lives between birth and five will become the future highest achievers with a lifelong love of learning. Authors of Literacy Centers for The Primary Classroom (1999, Dominie Press, also published in Australia in 2000, Addison Wesley Longman), which has sold over 12,000 copies, they have given dozens of workshops to teachers, preschool directors, and administrators. One of their workshops, given to 250 educators at the San Diego County Department of Education, resulted in several large school districts reaching out to parents of newborns to educate them about the need to read to babies to prepare them for kindergarten. Ms. Blakemore, in addition to her masters degree from the University of California at Berkeley, has other certificates and credentials including a certificate in Reading Recovery, the highest and most rigorous level of training for reading specialists, a language development specialist credential, and preschool director and Montessori training. She has received several recognition awards in language arts from the San Diego County of Education. She was recognized as the1992 Teacher of the Year from her school district, and was one of the ten Teachers of the Year from San Diego County. Author of a number of articles for educational newsletters, as well as an article on emergent literacy for a book published by Promising Practices, she has served as adjunct faculty at California State University San Marcos, teaching elementary literacy in the teacher credential program. Ms. Blakemore is currently an emergent literacy consultant for public and private schools that includes giving workshops to educators as well as parents of newborns on the importance of starting a reading routine from birth. Ms. Ramirez is a native Spanish speaker who was born in Mexico City and presently designs curriculum for Spanish speaking students and their parents. Currently she is a Title1 Reading Specialist (Reading Recovery certified) in a School district in North San Diego County where she gives workshops to second language parents, teaching them the value of reading to their babies. Presently she runs an outreach program for Spanish speaking parents of newborns to two-year-olds. In these workshops, parents bring their babies and are shown how to read to them from a wide variety of baby books. They are given direct assistance and reassured about any concerns. Babies who are brought to these workshops by their parents will be better prepared for kindergarten because of their access to books and read-alouds. Ms. Ramirez has received several recognition awards from the San Diego County Office of Education for her contributions to language arts. She designed and produced a training video for parents called Parents as Teachers which has been used extensively to train new parents about the importance of talking and reading to their babies and toddlers. The video, distributed to school districts in San Diego County, is used for both English and Spanish speaking parents. For five years, she wrote the K-1 edition of Mi Globo, a Spanish language newspaper (the Spanish equivalent of Weekly Reader) sold to schools nationwide.